For his third camping trip up on the peak of Mt. Innova, where he works as the operations manager, the young whipper snapper of a composer Chris Campbell dips his feet into the wading pools of two different musical worlds–avant-garde classical and indy almost-rock–and blends them stitchlessly. 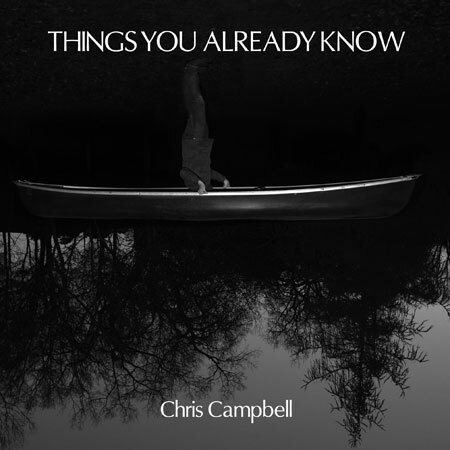 On this new CD, which is called Things You Already Know, Chris presents a loosely organized collection of sounds you never even knew belonged together…until now. Instrumentally, he achieves this by combining the unusual: propane tank drums, bowed psaltery and singing bowls, with the usual: guitar, cello, piano and drums. Opening with a brief overture called “Form = Emptiness,” Chris establishes an incredibly mellow mood with nothing more than a sparse, lyrical theme on piano accompanied by a bit of plaintive singing far off in the background. “Lord Byron” kicks it up a huge notch as it segues back and forth between oddly rhythmic woozy workouts on stringed instruments and percussion that coalesce into busy blurs, only to lapse into quiet, tinkling contemplation. Then, on a wooden nickel, some super lyrical violin sweeps you away into Swoonville for a while until–bam!–it’s off with your head as you’re sent packing back to that gray area of shambling oddities. This track perfectly encapsulates Chris’ aesthetic of “accumulation and punctuation,” which artistically reflects how the outside world gets inside each of us. You are currently browsing the archives for the Chris Campbell category.